A cracking cat scratcher so good even naughty moggies will love it! This is a big scratcher, designed to give your cat the full work out. Did you know scratching helps tone shoulders and back muscles as well as their paws? 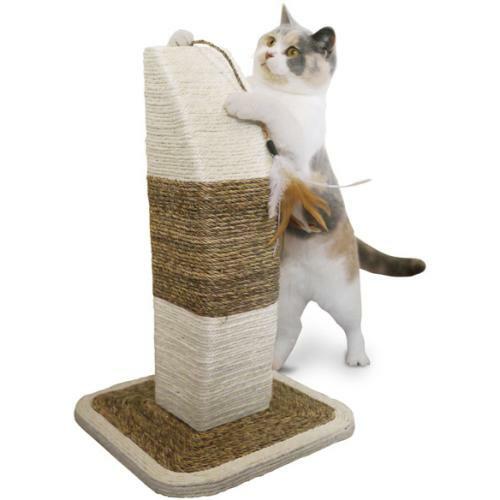 The strong sail shaped post has been lovingly wrapped in two kinds of natural fibres which are ideal for keeping claws sharp, without the snagging you get with carpet. Even better, the jute and sisal have been entwined with catnip, which is the perfect attraction for those who've never seen a scratching post before.There's even a dangly feather plume, which cats find much more exciting (and tasty) than plush toys or rattle balls.